Aussie funk trio Cookin’ On 3 Burners drop the new video to track “The Jump Off”, a breaks-heavy instrumental that is the b-side of their most recent 45 “Warning feat. Kaiit“, which has already gone sold out in most stores. Both tracks are lifted from the band’s upcoming new album “Lab Experiments Vol.2″, the sequel to “Lab Experiments Vol. 1: Mixin“ from 2017. 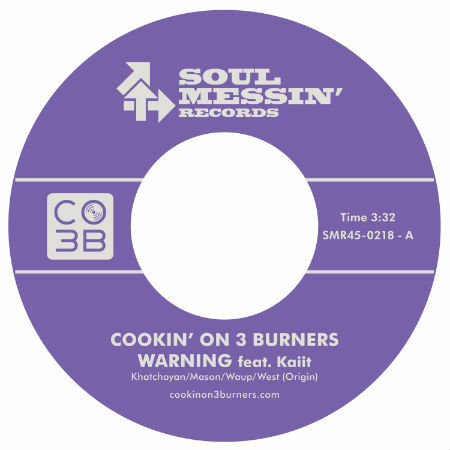 Since day one, B-boys and B-girls worldwide have been supporting Cookin’ On 3 Burners‘ heavy funk instrumentals. For the video to “The Jump Off”, the group put out the call asking for breakers to submit their moves and represent their city. The result is this crowd-sourced collaboration cut together highlighting their skills and celebrating the funk. The video features Wildup Crew from Rome: Bgirl Chimp, Bgirl Roika, Bgirl Saiko, Bgirl Zeta with video by Luca Bonfigli / Young Masters Crew from Melbourne: Bboy Ligi, Bboy King Rito, Bboy Lono with video by Ivan Khatchoyan / Bboy Levi from Erlangen / Bboy Bruce Wayne from Paris / Bboy Banjo from Sunshine.